This dosa batter is prepared out of mixing urad dal and semolina and hence it is named as urad - semolina or rava dosa. Here, fermentation is not necessary for the dosa batter, so you can do it whenever it is required. It tastes best when it is hot and can be relished along with coconut chutney. 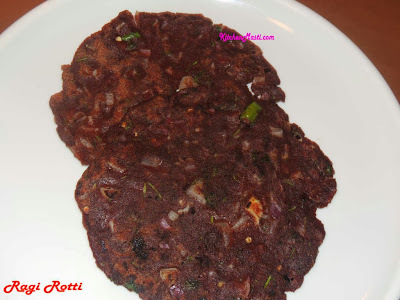 I have already published in one of my previous blog posts about urad and ragi dosa and so in this recipe we replace Ragi with rava. 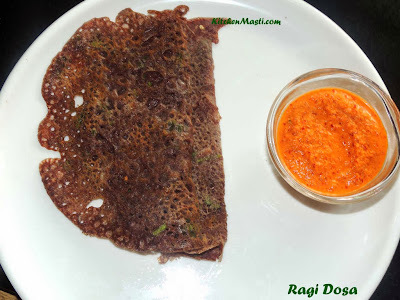 How To Prepare Urad - Semolina Dosa. The time taken to prepare this dosa is around 1 hour for soaking the urad dal and around 10 minutes for grinding the batter.The quantity mentioned here is enough for 3 servings. Ingredients For Urad Dal And Semolina Dosa. Urad Dal ( Black Gram ) - 1 cup. Water - as needed for the batter. 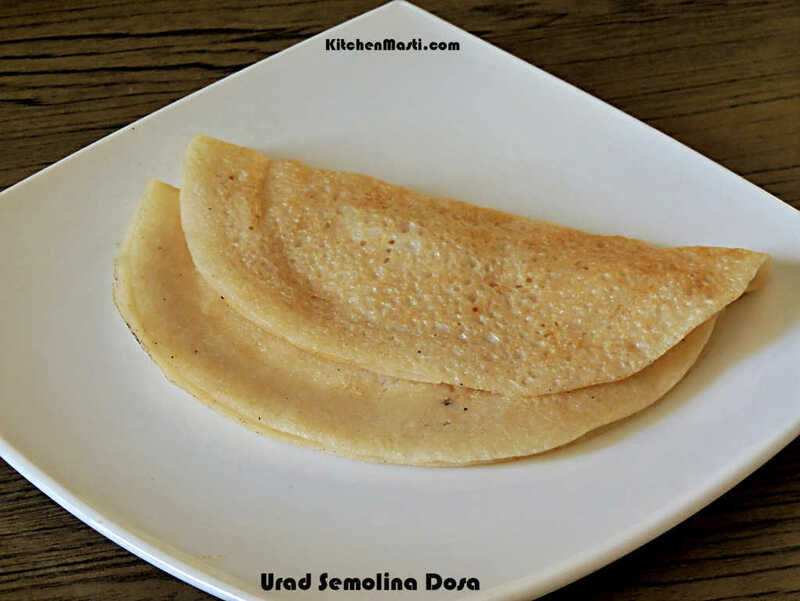 Method To Make Urad dal - Semolina Dosa. First and foremost wash the urad dal and soak it in the water for 1 hour. Pour semolina into that mixer jar and once again run the mixer for a minute. Now transfer the ground batter into a vessel. Add curds and salt. Mix it well. Heat a nonstick pan or a tawa. When heated, smear a tsp of oil on the pan and drop the batter with a ladle. Swirl it in a circular motion spreading on all over the pan. Close the pan with a lid for around a minute. Flip the dosa on the other side and roast it till brown spots appear. Transfer the dosa on to the serving plate. Your soft and instant urad semolina dosa is ready to be served.!!!!!. Instead of grinding the rava, you can also mix it directly with the ground urad batter. Eat this dosa when it is hot. I have used medium sized rava in this recipe ( upma rava ). This dosa is not an ideal tiffin box recipe. hi Avani, Its not possible to preserve the batter for a long time..